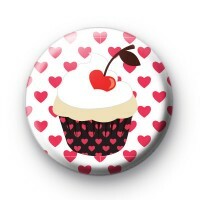 This 1-inch button badge is covered in red love hearts & has a yummy looking cupcake with a heart shaped cherry on top. Its a cupcake full of love. Bakers and romantics the world over need this badge. It would look lovely as part of your Valentines Day Card or in any craft projects. All our button badges are handmade in Cornwall and we have a huge selection of cupcake badges in the shop, perfect for all those people with a sweet tooth.